The Todd Bird Club, named after the noted Western Pennsylvania ornithologist W. E. Clyde Todd, was organized in 1982 in Indiana to promote the appreciation and conservation of birds in Indiana, Armstrong, and Cambria counties. Todd has grown to a membership of more than 80. Members, including those of all ages from student to retiree, may participate in as few or as many events as they wish. Todd Bird Club holds field trips every Saturday during migration, both spring and fall. 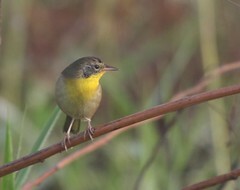 In addition, Todd sponsors Tuesday morning outings for weekday birders throughout the year. Outings’ destinations include Yellow Creek State Park, Crooked Creek Park and the Allegheny River, Conemaugh Dam, the Elders Ridge/West Lebanon strips, Blue Spruce County Park, Pine Ridge County Park, Blacklick Valley Natural Area, and Keystone Reservoir as well as occasional trips out of state. Todd Bird Club has taken part in several studies since its beginnings. Members worked extensively with the Pennsylvania Breeding Bird Atlas Project (1983-88) as well as the 2nd Breeding Bird Atlas Project (2004-2009). The club has also participated in the Special Areas Projects sponsored by the Pennsylvania Society for Ornithology. The goal of this project is to establish a top-quality bird list for every state park and other worthwhile areas within the state. Todd’s efforts have included Yellow Creek and Prince Gallitzin State Parks, Crooked Creek Park, as well as Blue Spruce, Pine Ridge, and Hemlock Lake County Parks and the Blacklick Valley Natural Area. We sponsor the Indiana Christmas Bird Count and pay all participants’ fees for it. We also participate in the Pennsylvania Migration Count the second Saturday of May. Todd Bird Club meetings begin at 7:00 p.m. the first Tuesday of the month, September through April, at Blue Spruce Lodge in Blue Spruce County Park, located just off Route 110 east of the town of Ernest. We socialize and snack till 7:30 when the meeting is called to order. At each meeting we discuss recent bird sightings, have a featured program, and enjoy refreshments. Our annual dinner is held the first Tuesday of May beginning at 6:00 p.m. It is a covered dish dinner, held at the Blue Spruce County Park Lodge. Todd boasts some of the best cooks in the county! The Todd Bird Club produces four newsletters per year. Included in these newsletters is information concerning meetings, outings, and bird sightings, as well as interesting articles written by members. The Todd Bird Club has a Facebook page, http://www.facebook.com/toddbirdclub! "Like" our Facebook page to join our conversation about birding. Keep us updated on your latest outings and bird sightings. Share your photos and videos. The Todd Bird Club adheres to the American Birding Association's Code of Birding Ethics.